Email is one of, if not the, most popular form of digital communication. It’s a rare example of a digital service with a nearly 100% active user base. Email’s ubiquity makes it an ideal platform for marketing efforts. In the following article we’ll examine seven inspirational marketing examples. 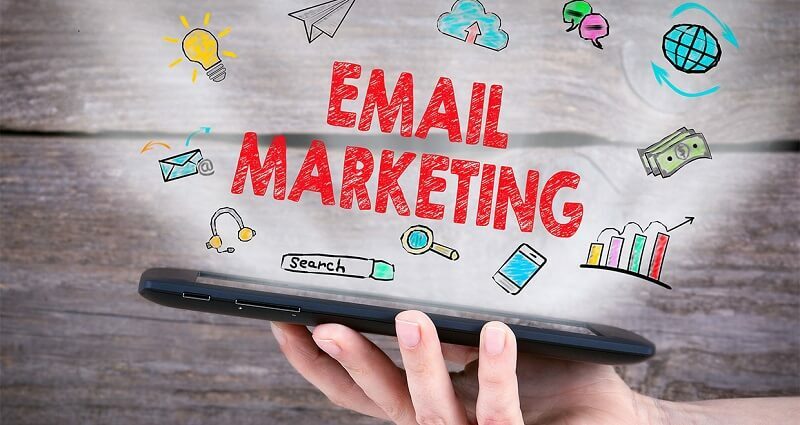 We’ll rank these email marketing content examples by overall applicability to small business use. The criteria used include overall cost, expected return, ease of implementation and overall effectiveness. PayPal recently gave most of their services a new look. To start, they rethemed their main website. And their marketing took up a similar style. As one of the email marketing content examples it showcases reframing customer expectations about inherent complexity. People usually think of anything involving money as inherently complex. PayPal decided to focus on showcasing how they could simplify some complex economic transactions. The most notable example comes from a simple email sent to most customers. It uses a few lines that showcase a common problem. Splitting the bill at a restaurant can be difficult. The email then shows customers how they can use PayPal to solve the problem. It’s among email marketing content examples that can serve as step by step instructions. The use of concise descriptions of a problem and solution are inspirational. While sparse but effective graphics serve as a perfect template. Fitness isn’t an easy sell. Runkeeper seems well aware of how easily they might scare away customers. 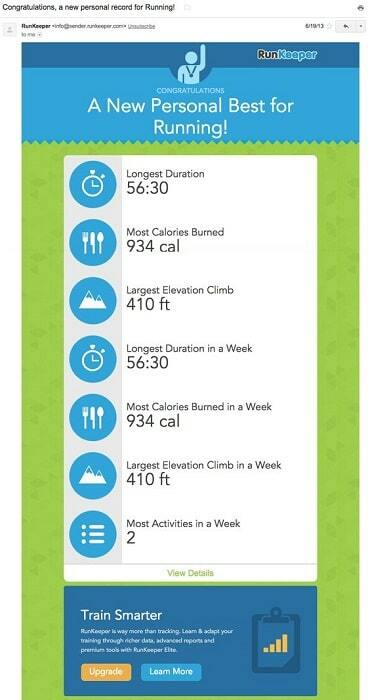 The fitness app monitors a user’s workouts. And it notes when they’ve stopped using the app. Runkeeper’s marketing team made a wise decision to have that prompt emails instead of text alerts. Sending an email telling lapsed users about changes makes it feel less like direct negative feedback. The phone is kept as a device to give positive feedback on a good run. Meanwhile the email serves to offer reminders about lapsed workouts. But most importantly, Runkeeper ensures that these emails have a friendly and non-judgemental tone. Runkeeper’s emails excitedly invite people to try out new features. In contrast to telling them that they need to get back onto a workout routine. It’s among email marketing content examples which any app centered company could learn from. Orbitz offers a good example of traditional concepts honed to perfection. Their email campaigns tend to rethink some common assumptions about marketing. For example, sending out coupon codes isn’t unique. 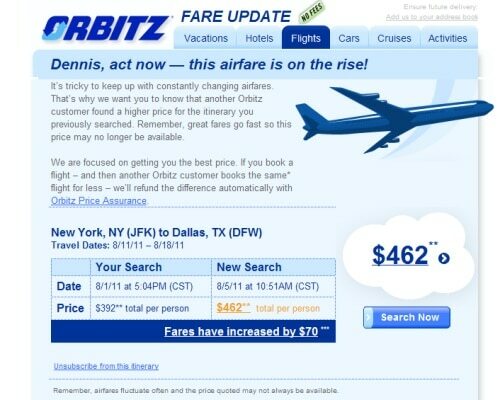 But when Orbitz does so they usually put extra effort into the message. They usually juxtapose inspiring images with very clear numbers. This pushes two important messages to a potential customer. The recipient instantly feels a desire to go to a highlighted area. And they have an impression of significant savings if they give in to that desire. It's important to note that they highlight savings alongside the desire to travel. The email addresses any reader's concern over cost before it even occurs to them. Instead of framing a trip as spending money, they’ll see it in terms of saving money. Luxury Garage Sale takes earlier ideas about minimalism to a new level. It’s one of the email marketing content examples that focuses on visual appeal. They use so little text that many people would assume it shouldn’t work. But their visually oriented marketing campaigns have been a huge success. They work under an assumption that readers are quite aware of how online sales work. 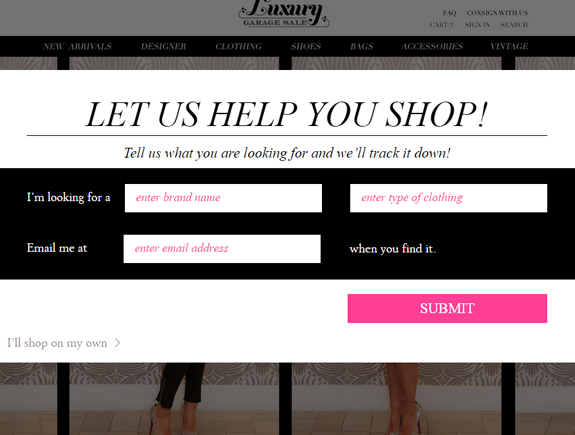 So instead of offering descriptions and instructions they focus on inventory. The emails only consist of images and one or two sentences. This makes the images themselves the message. And for items with visual appeal this can make for increased sales. Calls to action are a fairly common part of any pitch. It’s become so common that people can often forget why it’s done. UncommonGoods rethought the entire process by which companies use a call to action. An email from UncommonGoods will certainly have a call to action. But it’s among the email marketing content examples that reconsiders the concept. Their emails don’t just present a call to action. Instead, the emails highlight common motivations to take action. The emails are usually short and to the point. It might remind someone that they need to buy a gift for upcoming holidays. Or it might suggest options to ensure the gift arrives in time. But the need to take action is implicit and universal. The email starts by presenting something that everyone will agree needs action. It then offers up UncommonGoods as the next step. 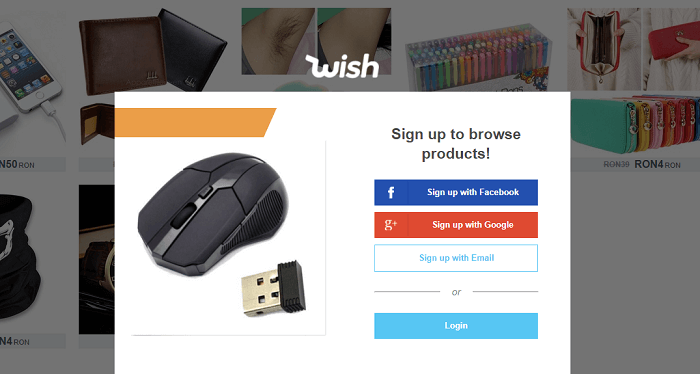 Wish managed to go from a startup competing with industry giants to a 10 billion dollar success. And clever online marketing is the biggest factor for their success against difficult odds. The first thing one notices about Wish is an inability to casually browse. People load the site in large part because they know there’s some great deals there. But they can’t actually see those deals without providing an email address. It creates an enviable position for Wish. They’re able to keep contact information for 100% of the people browsing the site. And in doing so they’re able to send out emails based on user interest. The emails are short, to the point and only take a second to read. It means that an email can be dismissed quite quickly. But it also means that an email can fully catch someone’s attention in a split second. It’s among the best email marketing content examples for companies who have rapidly shifting inventory. Wish constantly cycles through new items and deals. And they’re able to mirror this through concise but eye catching emails. Buzzfeed’s emails highlight how important an illusion of choice can be. The end result of a Buzzfeed email is always the same. Advertisements are sent out on a regular basis to people’s email address. But when people sign up they’re given choices to configure various options. This initial choice helps direct the subjects of later emails. The result is the same for Buzzfeed. They send out x advertisements to y customers featuring z number of items. But the recipients don’t feel like they’re being hounded. Instead they feel like they’re a part of the process. 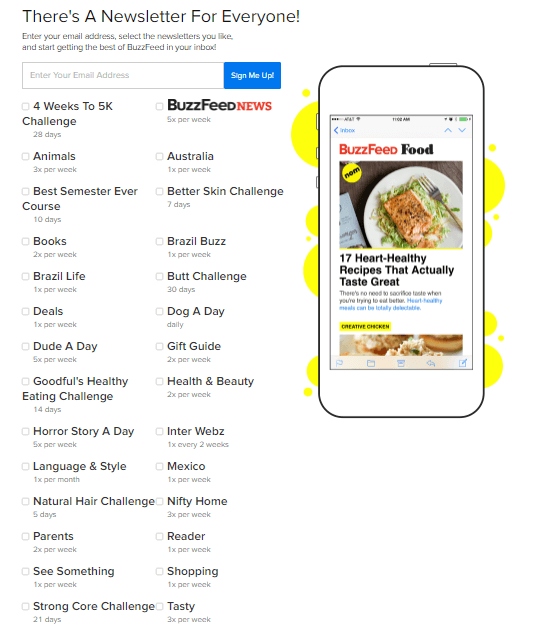 This also helps Buzzfeed tailor items to that user's preferences. The feeling of active involvement remains the most important aspect though. In conclusion, one can see that there’s many ways to run a successful email campaign. But it should be equally apparent that there’s no one way to do so. Most of these examples highlight a particular strength of the company. Marketing is just as much about matching marketing styles to product as it is selling that product. That’s also why readers should share their own results. There’s so much variety in experiences that one can always create unique innovations.